There’s nothing like falling into bed at the end of a long, hard day at work. It could be, quite possibly, one of the greatest feelings ever. But what if your mattress is old and wearing out? It can create all sorts of issues for your back, not to mention that it won’t be as enjoyable to fall into bed at the end of that long day you just had. Perhaps you have been searching and searching and just can’t decide on what to get. Or maybe you thought of searching for a new mattress today as you cracked and creaked your way off of your lumpy old sad excuse for a sleeping platform. Well, here is a short list of some great options to replace that sad mat you’ve been sleeping on. For the purposes of this post, we will be focusing more on twin sized mattresses for the solo sleeper, although most of these also have an option for up to queen or king sized as well. This is the perfect “Goldilocks” mattress. It isn’t too hard and it isn’t too soft either. Perhaps you don’t like the feeling of being eaten by your furniture, but you also don’t want to sleep on a rock either. This is the perfect in-between solution to your comfort needs. It is eleven inches deep and it features a plush, quilted top. This quilted top will take about twenty-four to forty-eight hours to fully take its shape after you unpack it. But then it will be ready to take on your shape. It sports a “Tri-Zone foam core”, which keeps you comfortable and prevents any feeling of motion between you and anyone sharing your bed. Sleep on your own little cloud, or move around as much as you like, knowing you won’t disturb your partner (or your dog). This mattress does not have any coils or springs, but it isn’t strictly memory foam either. It is, again, something in between. From another reviewer, “The dreamfoam mattress is “sturdier” than a memory foam, and it can’t be manipulated as much as a memory foam.” This mattress, and all of its components, are also made entirely in the United States of America. This is a great mattress that incorporates the best of coils and foam core technology. Don’t run at the sight of the word “coils”. These coils are individually encased in soft, polyester cotton jacquard. This helps to eliminate the feeling of motion and disturbance between partners, as well as provides optimum support. The coils also work to provide your body with an equal distribution of your weight across the mattress’ surface, providing relief to key pressure point areas. This mattress is also double sided. Both the top and bottom of this mattress feature a high density foam layer that will gently support your body and form to your unique shape. Also, because most people search online for just about everything these days, this company rolls and vacuum seals these mattresses for shipping. This creates a smaller package size, meaning that shipping is cheaper for you. And for peace of mind, this mattress has been tested and certified by CertiPur-US; it has been thoroughly tested for indoor emissions as well as environmental stewardship. This means you can rest assured knowing that the polyurethane used in the foam core is completely safe for your use. If you have ever dreamed of sleeping on a cloud, then with this mattress, your dreams are about to all come true. There are no springs or coils or any kind used in the construction of this plush mattress. Instead, the mattress features one and half inches of top layer pure memory foam, and are backed by four and half inches of high-density base support foam. It is covered in a “soft knitted fabric” for your complete and total comfort. So this marvelous mattress is just half a foot deep of memory foam and support foam for your complete ease, relaxation, and comfort. This mattress is also packed away using vacuum sealing technology. The mattress is compressed and rolled up for convenient and easy shipping right to your front door. The directions say it takes roughly twenty-four to forty-eight hours to fully decompress, and may even take up to a week for full decompression. However, you can still definitely sleep on this mattress as it is working to decompress; that won’t affect the decompression process at all. Some people complain of a mild latex smell but this dissipates fairly quickly as you unseal and unpack the mattress and allow it to air out. This mattress also has various thickness options, including 6 inches, 8 inches,10 inches, and a full 12 inches. Which helps to cut down on unpleasant chemical odors from manufacturing. This also helps to naturally fight against harmful bacteria growth in your mattress. This particular memory foam mattress is multi-layered for your support and full comfort. The top layer consists of two inches of memory foam infused with charcoal (to protect against bacteria growth). This layer is then followed by the intermediary layer. The intermediary layer is made up of two inches of “ventilated cool” foam. This ventilation layer helps to ensure smooth airflow throughout the mattress, helping it to stay well aired and also helping it to prevent harmful mold or bacteria growth. This airflow also helps to prevent any buildup of unpleasant odors. And finally, the last layer is made up of four inches of high density foam for extra support. The all-foam design of this mattress helps to take any pressure off of trigger points in your body, ensuring that you receive a comfortable, relaxing night’s sleep. The twin sized mattress comes in eight inches, ten inches, or six inches. This is an eleven inch mattress overstuffed with comfort. It has the highest luxury in mind in its construction. On the surface, one and a half inches of latex provides a gentle, comfortable cushion which will naturally conform to your unique body shape. This latex layer is followed by a four pound dense gel memory foam layer to help to relieve stress from your body’s pressure points while simultaneously helping to reduce any movement from partners or pets so you can sleep undisturbed. The gel memory foam layer is backed by seven and a half inches of super high density foam to provide a comfortable, yet solid support system. This all combines to work together to provide you with top-notch comfort and support in a luxurious, five-star dream cloud. This mattress is made from components all constructed in the United States of America. This mattress is also backed with a 20-year warranty, and so is well worth the cost. The quilted top is actually a removable cover which can easily be unzipped and machine washed on a low setting. This will make cleaning your dream cloud super quick and easy. The Ghostbed company also strives to provide top-notch shipping. Ghostbed has eight different warehouses all over the country and so can ship your new luxury bed to you within twenty four hours of order confirmation. Quick, top-of-the-line service, and luxurious comfort will lull you to sleep every single night for the most satisfying rest that you will ever have. Take into account absolutely everything you really need from your mattress. Do you require extra support? Would you prefer to sleep on heavenly clouds of memory foam? Do you need some sort of in-between combination of springs and memory foam? What will work best for you? The clear winner for this overall though, is the Ghostbed mattress. They have a clear dedication to quality as well as customer service. Ghostbed also offers the best warranty out of all the mattresses. They boast a twenty year warranty to help ensure that you have the absolute best for the longest time possible. Of course, with this also comes the inflated price tag, but for a twenty year manufacturer’s warranty it is well worth it. If you are on a budget though, it may be best to go with the Sleep Master Ultima Comfort Memory Foam 6 Inch Mattress, particularly if you want an all-foam mattress, rather than a combination spring and memory foam mattress. This budget-friendly mattress is perfect for those needing a little more comfort while going easy on your wallet. Or if you’re looking for something a little more high end, but not quite as costly as the Ghostbed luxury dream mattress, opt for the Dreamfoam Bedding Ultimate Dreams Crazy Quilt Pillow Top Mattress. 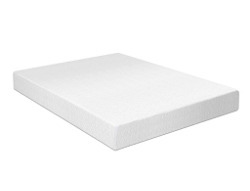 While it is entirely foam, no springs or coils, the foam is much more high density and so provides greater support than other memory foam mattresses. So you decide now what will ultimately work the best for you.